The Red, Blue and Black courses at the Streamsong Resort lie on a sizeable tract of reclaimed land within an enormous 16,000-acre property that was once heavily mined by the Mosaic corporation, a leading company in the supply of phosphate and potash to the agricultural industry. As part of a laudable commitment to environmental sustainability, Mosaic decided the most appropriate action for the decades-old Polk County site was its transformation from industrial wasteland to upmarket golf resort in the mould of Bandon Dunes. And if this new facility was to gain a similar reputation to that of its counterpart in Oregon, then so much the better, because discerning golfers would more than likely flock to Streamsong in substantial numbers, keen to sample the golf on offer. Some will think the smartest move Mosaic made was at the outset of the project with the appointment of Tom Doak, Bill Coore and Ben Crenshaw – all three were involved at Bandon – as designers for the resort’s first two 18-hole layouts which opened for play in 2014. Such an architectural dream team was virtually guaranteed to deliver a world-class 36-hole golf complex and so Tom Doak’s Renaissance Golf Design Company was tasked with creating the Blue course whilst Coore and Crenshaw’s firm was detailed to lay out the Red course. Both courses feature generous fairways and few forced carries so the playability quotient for the average golfer is very favourable. The Blue occupies a central portion of the property and, as a consequence, is the more open of the two layouts. The signature hole on the Blue may well be the par three 7th, with its wonderfully contoured green nestled between a lake to the front and huge sand dunes to the rear. "My younger associates and I discussed, more than once, the idea of putting in a zip line to get across the pond on the 7th hole at Streamsong." Commented Tom Doak in his Little Red Book of Golf Course Architecture. "There were only two problems with our dream: 1) Mosaic is a very risk-averse company, and 2) There are alligators in that pond, which might be a problem if anyone fell off the zip line." On the back nine, the risk/reward 305-yard par four 13th is another stand out hole, where a ridge splits the fairway between an upper right portion and a lower left segment. In 2017, the Black course became the third 18-hole layout to open at Streamsong, set close to, but slightly away from, the Red and Blue courses. Designed by Gil Hanse and Jim Wagner, the Black occupies a vast, open tract that stylishly complements the other two courses at a wonderful 54-hole facility. Every golf course ranking I’ve seen has the Red course rated ahead of the Blue, this website included, so naturally I thought my opinion would conform with this, but to my surprise I’m giving the edge to the Blue. Let’s get its shortcomings out of the way first; the options provided by Coore & Crenshaw on the Red aren’t as plentiful on the Blue, the greens are tricky, contoured and they’re quick, personally I found them the trickiest of all three courses, and the walks between holes are more of a schlep than on the Red making for longer rounds, but boy there are some beautiful golf holes on this course. What struck me with the Blue is that there’s more rise and fall, characterised immediately with the 100’ high dune that you tee it up on at the first. I also felt that the Blue was more in keeping with its surroundings. Some will feel that it’s less spectacular than the Red but the course feels less manipulated to me. If I didn’t know better, I would have guessed that this was the first course to occupy the land at Streamsong. Whilst fairways are wide, both the greens and fairways are set at peculiar angles with club selection off the tee to find the right part of the fairway being paramount. The entrance to several greens also go unguarded by bunkers, instead Doak opts to use short grass and slopes with collection points as a hazard. And whilst most view the Blue as the easier layout, miss some of the greens on the wrong side and you’re making double if not more. The challenge for me also came from getting the ball close with a wedge, particularly when chipping. Whilst this observation also applies to a lesser degree on the Red, there are some harsh slopes and borrows in the greens that you need to guard from, not easy when you’re trying to nip the ball off tightly mown turf. Whilst the course felt more cohesive than the Red, it was the individuality of some of the holes that won me over. If I was to list my favourite ten holes across the resort, half of them would be at the Blue. The 1st with the mountainous high dune and the tucked green is completely non-conforming with most modern day golf architecture and is more akin to the golden age designs in Scotland before earth could be easily moved. Elevation changes are a feature of the opening four holes with the 4th being what I’d describe as a wow hole, where you hit your approach to the top of a hill flanked by towering sand traps and is one of a number of holes which features these odd centre-bunker tufts of grass like trolls heads that have been buried in the sand. The green on this hole again is straight out of golden-age design with the green, unprotected, just following the lie of the land. A par three then follows that although only a pitch has an intimidating drop-off into deep sand on the left and could play completely differently from one day to the next with pin position on this 70-yard deep green completely changing the complexion of the hole. 7, another great par three is pure theatre; sitting adjacent to the Red’s 16th it’s the signature hole of the resort and playing it, lives up to that billing. Set amongst the dunes that envelope it and only accessible by the beautifully curved footbridge over the alligator infested lake only adds to the tension. Like the Red, there is still maybe a mid-round dip in quality but this is only minor, and late on in the back 9, it does rise back to the same heady heights that it set early in the round. On the day, the 12th was played into the wind making it a fierce carry over water where the lake continued along the length of the latter half of the hole that will make any sliced approach end with a splash. 13 and 14 complement one another well with a wonderful short par four followed by a climbing par 5 with one of those “carry as much as you dare” tee shots over the lake. 17 and 18 then may be the best on the course. The tee on 17 is set amongst the sandy wasteland whilst further up the fairway await a string of diagonally placed cross bunkers at the approach to a rise in the fairway that punish a slightly mishit chance at the green or leave the less brave with a much longer mid to long iron approach to a two tiered green. Similarly, 18 is a spectacular setting with the backdrop of the clubhouse and a fairway that flows like a wave from left to right with some spectacularly placed bunkers that bespeckle the lower right hand side of the fairway. Streamsong is one of the hottest golf destinations in the world right now (not just in temperature). People debate whether Red or Blue is better, but both are great. I think Streamsong Blue is worthy of its high ranking and praise. I personally like it better than the Red course. The Red comes off a bit gimmicky in spots, while the Blue is balanced. I think the greens on the Blue course are a little more wild, but fun. 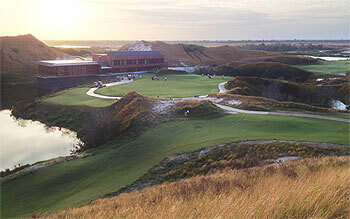 Streamsong’s Blue course has been created by Tom Doak and his team at Renaissance Design. The Red and the Blue are perfect compliments to each other and the Blue course enjoys a wonderful flow and is perfectly walkable. I was fortunate to have been able to go out early with only my caddie, take about 50 pictures play relaxed with no rush and walk the course in 2 hours and 10 minutes. Granted that’s fast and the average rounds will take twice that amount of time but the main point is it’s a joy to walk. Right from the start on top of a high dune Doak takes us out with a visually spectacular and breathtaking risk reward tee shot. A great starting par 4. After the first hole the Blue course quickly gets challenging. The second hole is a challenging 3 shot par 5, at least for the author. It requires 3 very carefully placed shots and was playing straight into the breeze. The 3rd hole is challenging as Doak masterfully uses a single bunker to give the feeling that there is hardly any space to aim while in fact there is tons of width to work with. The 4th hole is one of my favorites. After a challenging drive the approach is to a raised green requiring you to take on one of the biggest blowout bunkers you will see. A beautiful hole with an intimidating semi blind approach. The run of holes leading up to the visually spectacular par 3 7th all deserve their own detailed description. The 7th on the other hand has become one of the resorts signature holes. It’s a challenging medium length par 3 player from high on a dune over water to a large and crazy green full of undulations. Fortunately for the visiting golfers there are no let downs on the course. Its just remains very solid with an excellent flow and many interesting and fun holes that blend seamlessly into the surrounding landscape. The 13th is a unique short par 4, perhaps drivable by some big hitters or in the right wind. The hole narrows significantly the further you try to hit your drive. I did have a bit of a go at it and got away with murder hitting a low-ish straight burner that stopped about 30 short of the green and amazingly out of trouble. After walking up to this area which was largely blind from the tee I have to say I wouldn’t go for it again even though I was rewarded with a 3 after a nice pitch. I wrote that off immediately to “ignorance is bliss”. That however, only works once. The 17th and 18th are a really tough closing stretch and two excellent holes. The 17th forces a tough choice on the 2nd shot to either lay up or go for it when faces with some tough centerline bunkers placed at a diagonal line running left to right in the direction of the line of play. The 18th is a serious test and excellent closing par 4 requiring a strong drive and mid to long iron than can be chased into a bowl were the last green is located. Streamsong packs a wonderful experience into these two courses that is surely to only be strengthened by the addition of the Black Course by Gil Hanse. The resort has a excellent high end hotel which while not cheap by any means is located right there and perfectly suits their target clientele. It’s modern luxury and with the next accommodation being more than an hour away in my opinion everyone should stay there and enjoy it. 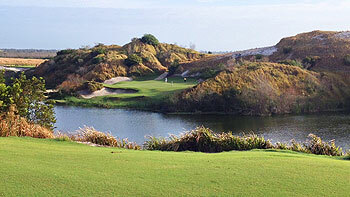 Florida is not the mental image that comes to mind when you see a picture of the golf course at Streamsong. 12 million yards of earth were moved to build the two courses and it took an otherwise flat terrain and created sand dunes and lots of elevation changes. The other natural benefit of Streamsong is that Florida was at one time under water, thus the soil is very sandy. Although there are trees at the perimeter of both courses, they do not come into play, both are wide open and bumping and running the ball are a delightfully consistent part of the golf here. The tee areas blend into the fairways and are not really distinctive tee boxes. This no doubt makes mowing and maintenance easy, and creates a lot of options on tee placement. Nowhere is this more in evidence than the fifth hole, which gives the player many options including putting off the tee. The hole is a downhill par three of between 102 and 150 yards depending on the tees you play and where the pin is. When we got to the tee someone in my group pointed out that you could actually putt the ball to the green given that the flag was front left and there was fairway all the way from tee to green. As I am always up for a stupid challenge I decided to tee off with a putter and ended up about a foot short of the green! My favorite hole on the Blue course is the par three seventh which is “the” picture hole everyone captures when playing Streamsong, and for good reason. It is such a picturesque hole of between 178 and 203 yards, and a delight to play over water into such a secluded area between the sand dunes. The other hole I really liked is number thirteen, similar to a hole at Pacific Dunes, a par four of between 279 and 312 yards that gets progressively more narrow as you get to the green, which is set up on a hill and is well bunkered. Some of the greens on the course are border line tricked up, like the twelfth, a par four, with its massive humps and slope. The course has a relatively easy start, but makes up for it with a very difficult finish, especially the 600-yard into the wind 17th hole. The Blue course is tremendous fun. Driving areas are fairly open but the challenge is not only to place the ball on the green but to place it in the proper position. Doak has crafted a fascinating set of greens to compliment a beautiful flowing layout. The ground is open and has a definite links look to it, but the turf is not quite firm enough for the course to play like a links. The elevation changes are something to behold for a course in Florida, beginning with the first tee box. I loved many of these holes, particularly the par 4 4th, which was a gentle left dog leg with an approach to an elevated green. There are a great collection of short and long par 3's, all of which challenge you to not only hit the green but hit it in the right location or face a 3 putt or worse. Because of the open fairways I think golfers of all skill levels would enjoy playing this course. I haven't been to Bandon Dunes yet, though it is next up on my list of golf resorts to visit as I try to play as many top public access courses in the USA as I can. I plan to return to Streamsong to play the newly built Black course when it opens in the fall of 2017, and after I play Bandon I may come back and give an update comparing the two sites. If you are on the east, south or central portion of the USA it's well worth a trip to Streamsong. Is Streamsong Florida’s premier golf resort? Just got back from a return trip to Streamsong to play the new Black course as well enjoying the Red and Blue again. If anything I think the Blue is better than I thought. The greens are absolutely brilliant. A mis struck iron may find the green but it is on the putting surface that the adventure begins. I always felt like a good shot was rewarded and a bad shot punished but always playable. Great course, great fun, great challenge. Can't wait to go back. A group of 8 played this course 2 weeks ago (handicaps 2 to 9) during a 10 day trip playing 10 different courses including both courses at World Woods, Mission Inn, Southern Dunes and Victoria Hills. Each of us rated Blue as comfortably the best course on the trip (which also included the Red). Personally, it is one of my favourite courses alongside Royal County Down, Chambers Bay, Muirfield, Les Bordes, Pinehurst 2, Pebble Beach, Doonbeg, Old Head and all 4 at Bandon Dunes. It is very playable as it provides room off the tee. The stretch of holes from 14 to 18 are as good as anything ive played with the majestic par 5, 17th taking our collective breaths away. The condition of the tees, fairways and greens was immaculate and a stunning contrast to the waste areas surrounding. There is no weak hole on the course and it is more beautiful even than the photos on the website.The Red course is brilliant, Blue is better. Its not cheap but it is top end and little touches like providing water bottles every 3 holes makes a difference. 2 comments if I may. It is very tough walking the course as many of the paths comprise very soft sand. This is unfortunate as walking rather than riding is the optimum way of experiencing the golf course. Secondly, as it is a "second shot" course, it is no surprise that the greens and their surrounds are challenging. However they are ultra fast and sloping (reminded me of St Andrews castle course before the greens were moderated). The concerning thing is that they were only considered medium by the guys working at the Resort so would be almost unplayable, certainly for amateur golfers, when considered fast. There were certainly many 3 putts and a couple of 4 putts in our group, even by some otherwise very solid putters. In saying this however, I would recommend anyone that is going to Florida to play golf to skip the usual Disney golf offering and make the hour drive to Streamsong. In summary, a hugely memorable 2 days playing Blue and Red. It’s high time someone wrote a 6 ball review of Streamsong Blue on this site. From the moment the golfer gains the last of the fifty feet of elevation at the 1st tee, until (s)he negotiates the wild contours on the 18th green, Streamsong Blue is pure pleasure, comparable to any of Tom Doak’s other works. The fairways are generous, but configured so there is always a preferred line to the green, a line that often skirts a sandy or watery hazard. Doak provides options on most approach shots, and the running game is almost always one of them. The large greens are more heavily contoured than those at the Red course. And while some see this as a negative, I found the challenge fun, without being daunting.Comparisons to Bandon Dunes are in order here. There may not be as much golf (and the resort lacks Bandon’s “all golf, all the time” vibe), but the better weather and easier access from most of the country are offsets. While Doak and the Red course duo of Bill Coore and Ben Crenshaw are said to have routed the two courses collaboratively, I found the land on the northern edge of the property (holes 9-11) to be flatter and less interesting. That, in my mind, is the primary difference in the quality of the two courses. Saying I prefer the Red (but just by an iota) does nothing to demean the Blue course. Mountain Lake is less than an hour away, and these three comprise my favorite co-located Florida golf trio, surpassing even Seminole, Pine Tree and any third south Florida course one might add. On the very day 20/01/15 it was announced there is to be a third course created at the famed Streamsong resort, I had the pleasure of teeing it up around the Doak designed Blue course. After a warm country club feel on arrival ala bag drop, it was onto the raised first tee and another welcome from the well informed starter. He suggested the Black tees for the day at 6700yards – no pressure then! The first tee shot from what seemed the highest point on the course offered up a 75yard wide fairway and a wedge approach. A nice opener. The par 5 second asked for a fade off the tee although sadly having made the greenside bunker it only resulted in a par. The third tee shot must be negotiated with a hungry fairway bunker on the right before a short iron approach to a raised green – another early round reminder that this was links golf! Another raised approach to the 4th which calls for not just half a club but a FULL club more than the distance suggests. For a new design (2013) it was refreshing to see such a short par 3 at the next which called for a wedge at 121yards and better still it yielded my first birdie of the day. The 6th demands a 200yard tee shot and wedge approach before the signature hole 7th. Quite an intimidating tee shot over the water with alligators perching on the bank I took my bogey and ran. Eight allows the shoulders to be truly opened before a mid-iron approach to green slopping back to front and right to left. The blind tee shot off the par 5 ninth lends itself to another links trait and with the green out of range for me it still took plenty of work to a narrow approach to secure my par. The par 3 tenth turns for home and after a hard fought par 4 at the index 1 eleventh hole we came to my favourite hole of the round- the 12th. Although only 390yds I hit a full 3WD to a slightly blind landing area before an approach over water to a slick undulating well bunkered green. The colour contrast of fescue, water and green grass for this second shot will stay with me for a long time! Short 13th should give up a par before the par 5 14th which requires a tee shot over water – thanks to the lord we weren’t playing off the green (tips) tees which seemed to be another 75yds back! – and given a good drive it gave up a birdie and it was needed before the tough run in. Fifteen although generous off the tee required a mid-iron approach and after a weak bogey it as onto the longest of the par 3’s and 16. Left edge of the green is a good line off the tee as everything feeds right and another green which slope kept me guessing. This one sloped not only left to right but front to back. Seventeen and last of the par 5 needed a good 1WD and hybrid just to carry the fairway bunkers that dissect the fairway. Two lovely what looked like cypress trees made for more colour contrast in amongst the fescue, sand and lust grass before a 7ir approach to a two tired green. There are no gimme holes here!! Eighteen at 453yds into a what by now was a two club wind resulted in a disappointing double especially given I had negotiated the many fairway & greenside bunkers. However with the sun on my back for late January and soon to have the best chicken wings this side of Sawgrass I took my pew in the bar and reflected on what was anything but you typical Floridian golf course. CONCLUSION As close to an inland links as you will find with lots of changes in elevation with dramatic sand dunes and in some cases endless fairway bunkers. It’s no coincidence that Doak has four designs in the WORLD top 100! Generous off the tee for me, this was a classic second shot course to generous greens but with run offs in the Donald Ross mould making distance control key. A fantastic variety in par 3’s all playing in different directions it was a good mixture of fun golf mixed up with holes where you had to fight for par and in some cases bogey! The black course although not due to open until September / October 2017 and designed by Olympic course router Gill Hanse will no doubt further put this resort on the go-to map for golfers visiting the sunshine state. A year on from a first visit to Streamsong to play the Red course our group were very excited to complete the 36 holes with a round on Blue. As mentioned by all who visit, the look of these courses are as far from what ‘Florida golf’ normally offers as you can imagine – both top-end courses with some fantastic visuals around the resort and beautiful rugged bunkering on all holes. I would say that scores on the Blue are likely to be a shot or two better than Red due to wider fairways giving a few more chances to hit greens in regulation. First thing is to choose your tee wisely with the Green set only for those who are happy with a 7176 yard course! The opening hole is very nice indeed; an elevated tee to a wide fairway but the key-shot is the approach – you are likely only to be able to see the top half of the flag, distance is key and anything long will hit the perfectly placed run-off and then you will have a tricky chip back, very clever design. The 4th is a favourite of mine, around 420 yards (black tee) with a very tough uphill approach…When playing the first six holes on the Blue, there is an unbelievable anticipation of getting to the 7th tee – this like the 16th on Red are the stand-out par-3’s across both courses. Blue’s 7th plays around 188 yards over water to a green surrounded by huge dunes that is so easy to three putt – in time and maybe with a little TV coverage this hole will be seen as a world great short-hole in my opinion. My first pick on the back nine is the 12th, another strong par-4 with the approach over water the key-shot and then the last two holes are just superb. These holes cover more than 1000 yards but are not both par-5’s – the 17th is a brute nearing 600 yards with great bunkering at lay-up range and yet another green that asks plenty of questions. The last hole will depend on the wind direction on how it plays; downwind then a par-4 is there for the taking but if playing the hole ‘into’ then good luck if you need par to win your match. Overall the Blue course is a little behind the Red for me in terms of wow factor but this is just a small detail really. 36 fantastic holes at Streamsong and the breaking news is that work starts on third course soon and will be called ‘Black’ – the plans indicate that this course could be even better. Note to self, must return in spring 2017 to take a look…. Nb – If you are not aware of how the courses have been named, it is rather simple … just the colour of the Sharpies used on the original blueprints showing the holes as the two courses intertwine through each other.. The view from the first tee box immediately differentiates this property from everything else the State has to offer. Standing upon the lofty phosphate dune emphasizes how impressive the topology is at Streamsong. Some of the most exciting experiences at this resort involve the simple act of walking around the property and navigating through sand, dunes and waste areas. It’s a real nature walk at times uncovering the sand-covered staircases and natural terrain guiding you from green to tee-box. It’s a wonderfully rugged landscape, and although very young, you could sense that the rolling land was a natural evolution. Architects who prioritise the minimalistic approach and work with what the land gives them created both courses at Streamsong. Discovering many of the holes on the Blue course must have been as exciting as playing them for the first time. This course is overrated by Golf Magazine at #62 and doesn’t do justice to many other courses further down the rankings, but it is what is it and not worth crying over. I would describe this course as golfing on the moon. You feel like you’re hitting towards creators from another planet, or wouldn’t be surprised to see astronauts hitting a 6 iron that goes for miles and miles into the atmosphere. In my opinion, the visuals are spectacular and conditioning was really impressive. I was relieved that the fairways were not a traditional Bermuda grass seed. This course offers many birdies opportunities on both sides, as all of the par 5s are reachable, the wonderful design variety offers a high level of playability and accessible parts of the greens, short par 4s and it’s not too punishing at all. On the front side, the par 4 3rd hole has a tough drive over a lake onto a diagonal fairway running away from you, leading to an uphill approach shot to a deeply tiered green. Another standout hole on the front is the highly photographed par 3 7th hole which plays over a river to a green surrounded by enormous dunes. It’s not an easy green to hit and a thrilling tee shot. At this point, you’ll forget you’re in Florida. The back nine is relatively tame without any hole that poses a tremendous amount of difficulty prior to number 18. The Blue course does offer a nice surprise, in that you’ll find yourself hitting a few blind shots either from the tee or on the fairway. There are a few holes around the turn where you can’t see the green from the tee box (eg: number 9, number 11, number 14 and number 18) due to the natural rise in the land. I find this a great challenge and really asks a lot from your driver. The anticipation of wanting to know what’s over the hill really gets the juices flowing. The last hole on the Blue course is a monster if played into the wind like we did from the back (green) tees. I was lucky to reach the plateau of the fairway, but climbed the hill to discover that I then faced a 240-yard approach shot into a howling wind to a green wildly exposed (almost looked like it was in no man’s land) and all downhill from the top of the fairway. Out came the 1 iron. If the wind was blowing the other direction, one could drive over the hill and take advantage of the enormous downslope which could turn your approach shot into a Wedge. The genius in the architecture is Doak’s knowledge of the prevailing wind and the need for a hugely climatic finisher. The routing was well thought out, and generally follows the ‘out and back’ principle.